Place a pan of water on to boil. When the water comes to the boil, place eggs carefully into the pan and boil for 6 minutes then plunge the eggs into the iced water. When cool crack the eggs and peel the shell and place in a container and cover with water. Place the sausage meat into a separate bowl, season well with sea salt and black pepper. Shape into 70g balls. Cover a chopping board with cling film and place the ball of sausage meat onto the cling film, then cover with more cling film and roll into a ball/patty twice the size using a rolling pin. Remove the patty and mould around an egg, sealing the ends carefully. Repeat process for the rest of the eggs and chill in the fridge for 30 minutes, before coating. To prepare the coating, place the flour, beaten eggs and panko/bread crumbs into three separate bowls, season each with salt and pepper. Then roll the chilled sausage coated eggs into the flour first, shake off the excess flour, then drop into the beaten eggs, roll around and then shake the excess. Finally roll in the crumbs. Set the deep fat fryer to 165*c and place the scotch eggs into hot oil for 7 minutes for a soft yolk*. Take off the heat and carefully place onto kitchen paper and allow to cool before serving. 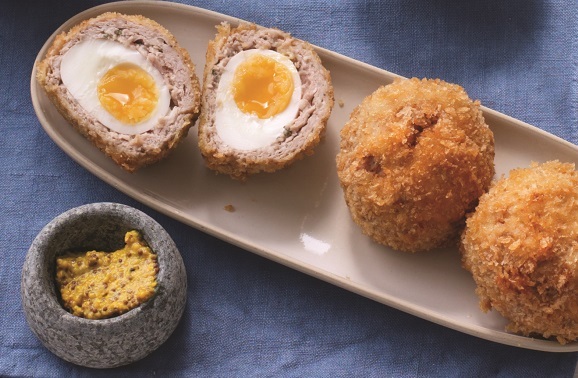 *Top Tip: If you prefer your scotch eggs to be more hard-boiled, then after frying them for 7 minutes, place them in an ovenproof dish into a hot oven for a further 5 minutes. Serve with a Ploughman’s lunch of pickles, chutneys, salad, cheese, slaw and a good crunchy wholegrain mustard like Cornish Meadow Preserve’s Grumpy Old Man’s Mustard.